DEEPER penetration into biological samples, along with potential applications in nanotechnology and quantum entanglement, are promised by Chromacity’s new 520nm laser. This air-cooled ytterbium fibre-based laser combines high power with ultrashort pulse durations, it says. A frequency-doubled version of the company’s Chromacity 1040 NIR laser, the Chromacity 520 has a fixed 520nm wavelength (green) and output power of 500mW or 1W. “As scientists experiment at deeper tissue levels, they need laser sources that operate in the visible spectrum” said Chromacity CEO Shahida Imani. He adds that the laser has interesting applications in nanoparticle development, because the absorption characteristic of materials including gold, copper, and some plastics are significantly higher at 520nm. There may also be advantages in advanced manufacturing, for techniques such as two-photon polymerisation and 3D printing. For the scientific research into non-linear dynamics, short duration pulses and high peak powers can be helpful. Applications include developments in OPO (optical parametric oscillator) pumping, four-wave mixing, amplifier seeding, and terahertz (THz) generation. 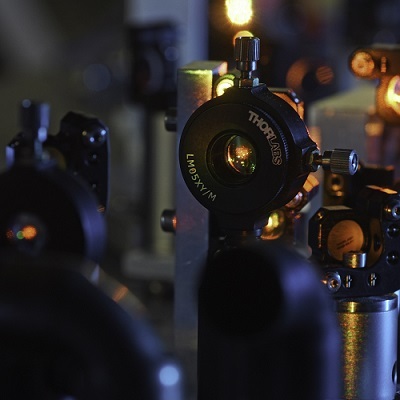 The company reports that the Chromacity 520 is already being used as a laser source for quantum entanglement of photons, with experiments at the University of Glasgow showing it can deliver at higher power and lower cost than alternatives. “The Chromacity 520 has the potential to be transformative for the field of research into quantum entanglement,” said Daniele Faccio, professor in quantum technologies at the University of Glasgow. “This laser technology provides a route to entangled photon pair generation at a fraction of the cost of Ti:Sapph (titanium-sapphire), with enough power for multiple research lines with photon pairs at wavelengths closer to Si-SPAD (silicon single-photon avalanche diode) peak efficiency”.